One IDF soldier was moderately injured and three were lightly hurt after being hit by three mortar shells fired at the Erez crossing in the northern Gaza Strip. 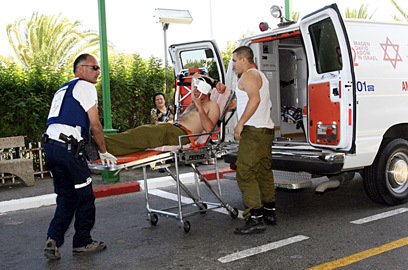 The injured were evacuated to the Barzilay Medical Center in Ashkelon along with six other troops who suffered from shock. Two additional mortar shells landed in a hothouse and in an open area in Gaza vicinity communities. Hamas claimed responsibility for the attack. Alongside the Qassam rocket fire, Palestinians are also firing mortar shells at areas close to the border fence. The terror organizations direct the shells to the Karni and Erez crossings, in a bid to disrupt the activity in the crossings and injure security forces. Soldiers from the base hit by the mortars told Ynet, "We suddenly heard an explosion. There was no prior warning, because there is no warning for mortars." The soldiers said that because of the base's proximity to the Gaza Strip they were under constant fear that mortars and Qassam rockets would be fired at the crossing. "We are already used to live under these threats. Luckily, this incident ended with only a number of light injuries and nothing more." Security sources said that the Palestinians were using the Erez crossing to carry out terror attacks. In June 2005, a female suicide bomber was captured wearing an explosive belt weighing more than 10 kilograms. The bomber was on her way to a medical test at the Soroka Medical Center in Be'er Sheva and was planning to carry out a terror attack there. In January 2004, a female suicide bomber detonated herself at the crossing, killing a Border Guard officer and a security guard. Military sources noted that the Israeli policy launched about three weeks ago, according to which the IDF initiates airstrikes and carries out limited ground defensive operations, would continue. The first targeted killing since the start of the current operation took place Friday evening, as the Air Force killed a senior Islamic Jihad member riding his motorcycle in the Khan Younis area. More than 60 terror activists, most of them Hamas members, have been killed since the start of the activity, IDF officials said. "We are currently not discussing results, and even if the number of Qassams is lower at the moment, it is too early to make any declarations. A lot of patience is needed for this activity to yield results," a source in the Southern Command said. Prime Minister Ehud Olmert addressed Israel's military activity in the Gaza Strip during Sunday's cabinet meeting. "We are not negotiating and not making any commitments regarding our patterns of behavior. Security force will continue to operate incessantly. No one is immune. Our activity will continue as long as we have to bring security to the citizens of Israel." Defense Minister Amir Peretz said, "We do not plan to let Hamas make the decision on a ceasefire. We must make certain that we prevent a situation in which Hamas solves its problems by firing at Israel. Sunday's attack followed a relatively quiet weekend in the western Negev and the Sderot area. On Saturday morning, a Qassam rocket landed near two buildings in Sderot. Four people were treated for shock, and the two buildings suffered damage. The al-Quds Brigades, the Islamic Jihad's military wing, claimed responsibility for the rocket attack. On Friday, five Qassam rockets were fired from the northern Gaza Strip. Two landed near a kibbutz in the Sha'ar Hanegev Regional Council, one of them causing damage to a garage. Another rocket landed in a kibbutz near Ashkelon and caused damage to a building. A fourth rocket was launched from the northern Strip, but landed on Palestinian territory. See all talkbacks "4 injured in mortar attack on Erez crossing"